Six Rotary Clubs come together for the first time in five years to help local charity provide mental health services for young people. 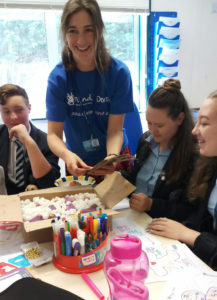 Dorset Mind, the mental health charity, have started to pilot their first stage of extensive plans to help support young people with their mental health. In order to do this, six local Rotary Clubs have pooled their resources to raise a total of £10,000 from the target of £15,000 required for the charity to afford an experienced Project Leader. The Rotary Clubs of Bournemouth, Bournemouth East Cliff, Bournemouth North, Christchurch, Poole Bay, and Westbourne have each pledged to raise their contribution in various ways. Rotary International is well-renowned for supporting local charities the world over – but this is the first time in five years that six clubs in Dorset have supported one cause with a sizeable donation. A project group including key Rotary Club delegates has worked alongside Dorset Mind to develop business plans and strategy. This will ensure the project is sustainable going forward. ‘Dorset Mind Your Head’ brings together a holistic approach to mental health support for young people. Proposed services include awareness raising campaigns; education programmes; befriending; counselling; telephone/email signposting; moderated online forums; and drop-in sessions. The charity estimates to run these services over five years they will require £1,117,000 to fund the complete programme. By appointing the project manager, they have begun to put the pilot scheme into action. Corfe Hills School, Bournemouth Collegiate School and The Grange School are the pilot schools. The charity is also working with Thomas Hardy School in Dorchester and the Purbeck Youth Centre. The feedback for ‘Dorset Mind Your Head’ has been excellent from the schools and students so far. Dorset Mind’s Chief Executive, Marianne Storey comments, “We’re so grateful to the six local Rotary Clubs that have helped fund our Project Manager to get this essential programme off the ground. National evidence states that 1 in 10 children and young people aged 5-16 are known to live with a diagnosable mental health condition. That’s around 3 children in every class. But, in our experience, we believe that number is actually much higher. The impact of this is huge. On the young people themselves of course, but also on their families, classmates, teachers and communities as a whole. But we know we can make a difference with this programme and we are passionate about making it a success. The key is to educate young people at an early age. And by doing so, there is a chance that we can stop small issues becoming considerable problems. Dorset Mind intends to roll-out their services across Dorset when they have been tried and tested. This also depends on when the money is in place to fund them. For more information, or if you would like to contribute towards these essential services for young people, please follow this link.